Jimmy Page’s guitar solo on Led Zeppelin’s Stairway To Heaven has been voted the greatest ever by Classic Rock magazine. His work on the 1971 track was voted no.1 by a panel of critics, bands and readers in the new issue of Classic Rock magazine which features the 100 Greatest Guitar Solos. 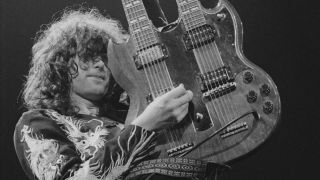 Jimmy Page tells Classic Rock: “Is Stairway To Heaven my best Zeppelin guitar solo? No, but it’s pretty damn good. The solo was done very quickly – in actual fact there were already layers underneath, the bottleneck you can hear was on before the solo. “Anyway, I just said, ‘Roll it,’ took a deep breath, that’s what I usually do, and then go. I had a couple of cracks at it because you didn’t have as many options as you would have now. Back then you had 16 tracks and could only put guitar solos down where the vocal wasn’t. Other solos to feature in the top 10 include Pink Floyd’s Comfortably Numb, Eagles classic Hotel California, Black Sabbath’s Paranoid and Prince’s Purple Rain. See the top 10 below. The full list of the 100 Greatest Guitar Solos features in the new issue of Classic Rock magazine, which is in-store on Saturday and available via TeamRock+ now.